If you’re ever running behind on a baby shower gift, this easy project is fast but oh so cute! I got this idea when I was 10 weeks pregnant and just starting to revel in all the fun things I would get to sew. In a little shop in the mountains Northern California I found the cutest little burp cloths. They were just cloth prefolds with the middle section covered in a hip cotton print. Three for $15. I was so tempted to purchase they were so pretty! But the rational me decided they would be way too easy to make to even consider spending $15 on them. Since my kid isn’t a spitter, I just use these for anything else. They are perfect milk-wipers, tear wipers, and anything wipers, so they are great to have around. It’s especially nice when something so useful looks so cute in the diaper bag. They look great stacked on the changing table, too! 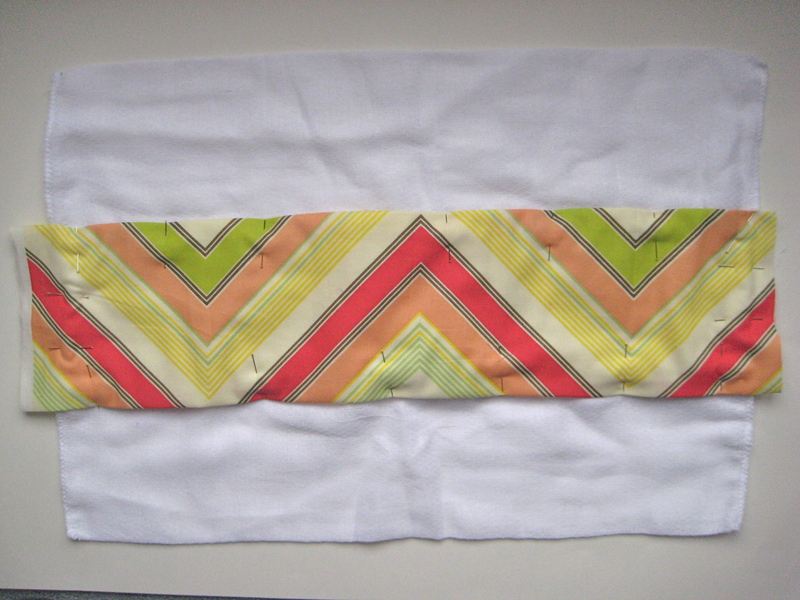 Step 1: Iron under 1/2″ on the long sides of your fabric strip. Step 2: Center strip on cloth diaper and pin in place. It doesn’t matter which side you do this on, just make sure you are covering the thickened section in the middle. Step 3: Sew the panel to the diaper using a line of stitching 1/4″ from the edge of the fabric. Step 4: Baste the short ends of the fabric to the diaper using a wide stitch 1/8″ from the edge of the diaper. Step 5: Remove any pins and serge short edges. Since the diapers are pre-serged, just serge right over the existing serging, making sure to cut the extra fabric as you go. Tip: Feed the diaper through diaper side up so you know where the edge is. If you don’t have a serger, use a zigzag stitch. Clip any hanging threads and you’re done! Make a few more and throw them in a bucket o’ burpees! I rolled mine together so they fit just right in the bucket. 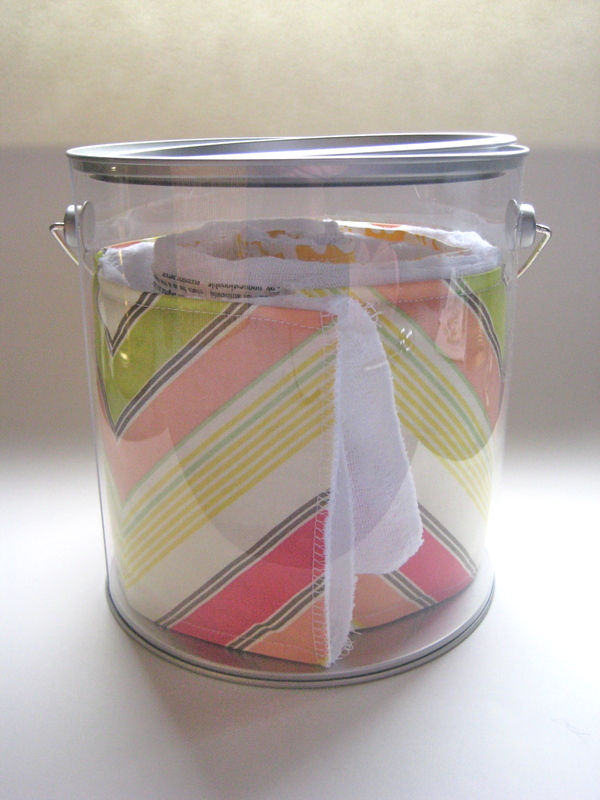 For the bucket, just print the free printable, cut it out and double stick tape it to the outside of the bucket. You can also print it on adhesive label paper to make it even easier. I love your burp rags! Link up! Adorable! I found you through a blog hop, and I’m now a follower. I hope you’ll come by and visit me too! I made a few of these today and posted about them! Hope you don’t mind that I sent my readers in your direction! I want to let you know that I just blogged about this great tutorial. I used one of your pictures and I also placed your button on the post for easy access to your wonderful tutorial! Thank you! Where did you get the stripped material, super cute!! This is a fabulous idea!! 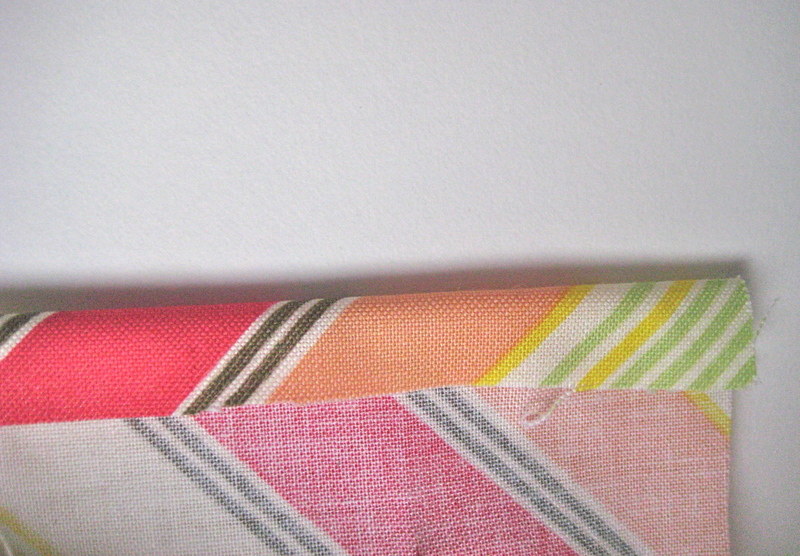 I LOVE the newsprint fabric! Where’d you find it? Just want to say THANK YOU for an awesome Tutorial. I made a few of these from your great instruction… I had to do a little modifying… I was using up scraps from a baby quilt project.. if you would like to read about my shout out to you, it’s available at my blog…Quilt Monster in my Closet. 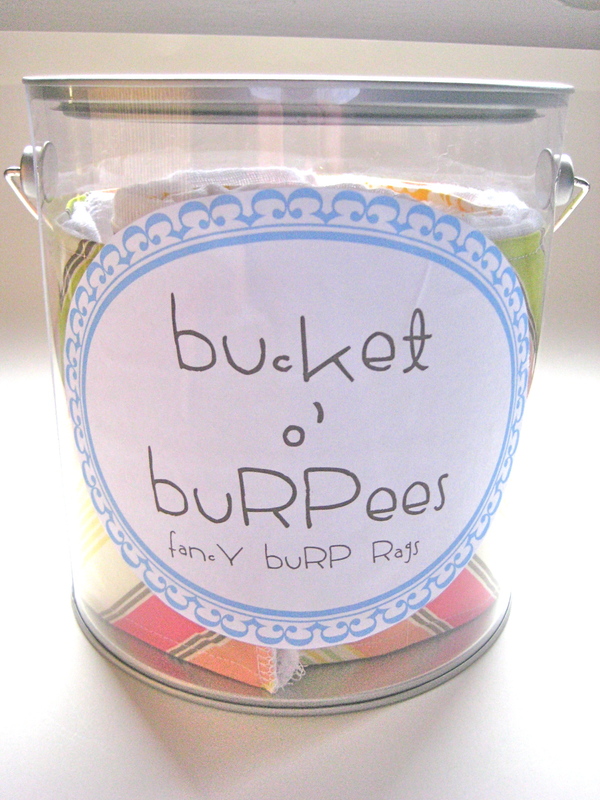 Just posted pic’s on my blog with my version of your bucket o’ burpees! I was looking for a way to package my burpies for a shower I am going to and this is perfect! I love it. Where did you find the clear bucket, I’ve looked around and can’t seem to find them. Thanks! Awesome, love it… Made a few today. Thanks for posting the tutorial!! I zig-zagged the long edges & it was a nice touch! I am so glad to have a go-to baby gift!